Hibernate is an option available under almost every operating system that provides users to shutdown the machine with current state i.e. ; all their work that is currently being done and loaded on the RAM will be stored onto the DISK and when we restart the operating system, all the processes will remain as they were running before hibernate process. Hibernation process saves the electrical power since the machine will not be running when hibernation done. And the good thing is we can continue our work where we've left when we restart the machine. In Microsoft Windows 7, "Hibernate" option will not be available by default. However, you can quickly enable Hibernate option under Microsoft Windows 7. Step 1: Go to control panel. You can choose "Control panel" dispalyed in the start menu or you can enter "control" in the run dialog box to open control panel. Step 2: Change the view options to "Small icons"/"Large icons". 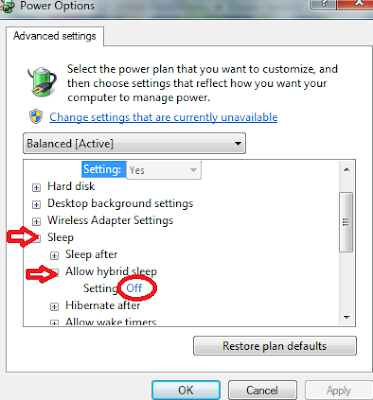 By default this options is selected as "Category"
Step 6: Expand "Sleep" and "Allow hybrid sleep" checkboxes and modify settting to "OFF". That's it, you can see the "Hibernate" options in the start menu now.